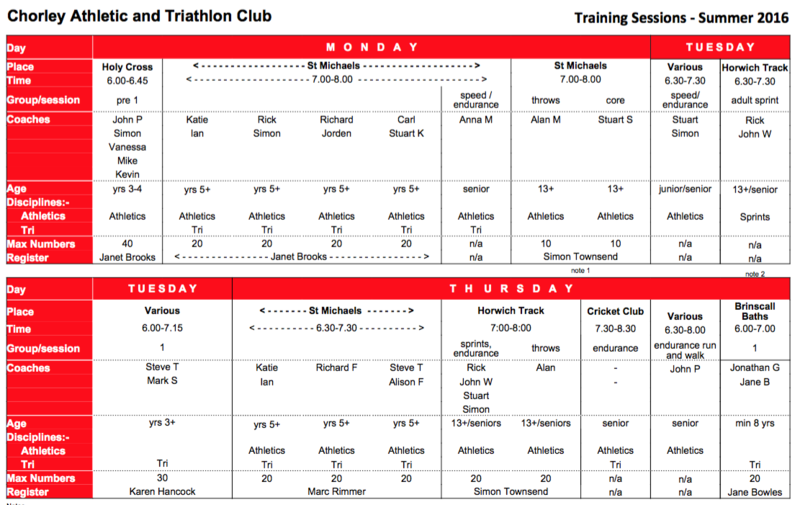 Below is a list of training sessions where all our members and people thinking of joining Chorley Athletic and Triathalon Club are welcome to attend. Any fees charged go to help offset real costs incurred with running the sessions. Thanks to all coaches and assistants who give up their time to help others. For endurance runners, the sessions concentrate on core strength (indoor) during the Winter, and speed and endurance during Summer. Monday nights - Holy Cross school from 19.00(7pm) and finishes at 20.00 (8pm). Lead coach is Anna Maria Crabtree. There are two sessions, one for sprinters and one for endurance athletes. The sessions take place on the track behind Bolton Arena every Thursday from 18:30 to 19:30. The cost is £2 for adults and £1 for concessions and juniors. Session content varies every week, but both are planned by experienced senior coaches. The great thing about track is that you are never more than 200m away from others, and it is thus ideal for complete beginners and experienced athletes alike. The Endurance Session(with Stuart, Jan, Carl and Simon) is intended for runners looking to complete at 400m upto 10K, on road, trail or track. Sessions typically include long warm ups and cool downs to avoid injury, repeats or 200m upto 800m with timed recoveries. Thursday nights - Chorley Cricket Club - Run starts at 19.00 (7.00pm) prompt. There are usually 2 -3 groups who go out on a run - There is usually a fast group and a group that are less fast. The groups are dependent on who turns up each week - the sessions are not coached. Runs vary in speed and length depending on weather and light at any given time of year. Runs will be either on the road or over the local hills/fells in the summer when light allows. Meet in the Cricket club bar before 7.00 to sort out which would be the most suitable group to join. There are shower facilities and access to the bar after the run for socialising with other runners (and cricketers).